The Cisco Catalyst 3550 series of switches is designed by Cisco as enterprise-class, stackable, multilayer intelligent Fast/Gigabit Ethernet switches that provide high availability, security and quality of service to enhance the operation of the network. Worldwide Supply carries pre-owned, refurbished and used Cisco Catalyst 3550 switches in most configurations. Cisco has created six different switch configurations, with a wide range of support for GBIC transceivers and the ability to create high levels of resiliency when deploying dual redundant Gigabit Ethernet uplinks. 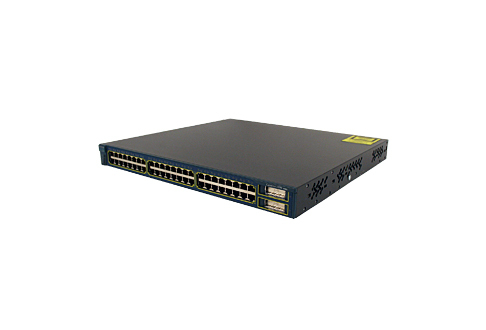 Cisco Catalyst 3550 Series accessories and modules are also available. Worldwide Supply offers an industry-leading lifetime warranty and the lowest price on Used Cisco C3550 Switches. The used Cisco 3550 series switches offered by Worldwide Supply are delivering high levels of intelligence in today’s networks at the edge, even when supporting desktops, IP phones, wireless LAN access points and managing a variety of bandwidth-intensive network applications. It’s all the intelligence you need at the network edge to enable your operations to remain profitable while delivering today’s leading Ethernet services. All Cisco switches, including Cisco Catalyst 3550 switches, are fully tested and guaranteed.